This view was taken in the summer of 1993. The slope of the hill faces east, you are looking northwest. The pond area is surrounded by American Arborvitae, planted several years earlier. I used a JD 3010 & loader to push dirt in the back ground to create a dike for the lower end of the pond. The depth of the shallow end tapers from 10" to 20" deep. 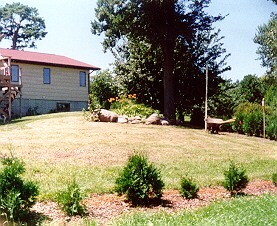 In the foreground, I dug out the deep end to about 3.5 feet in depth and finished the final landscaping in the spring. "94"
In the spring I finished digging out the deep end to 4.5 feet. I dug out 3 dump truck loads of soil by hand. Next I put down a layer of sand, about 1" deep to protect the liner from underneath. It took about 6 tons of sand to do this. These pictures were taken with a 110 film camera and I scanned them onto the PC with Hewlett Packard's 3c scanner. 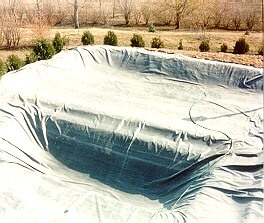 First I put down a 20 Mil Plastic liner. The Fun Part!!!! Then I put down the main liner. 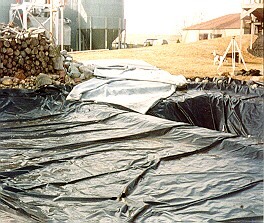 It's a 45 Mil EPDM roofing liner. This liner is 40 feet by 50 feet. 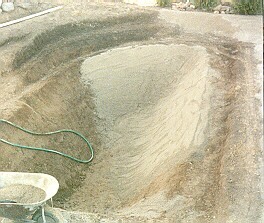 The Pond is approximately 30 feet by 30 feet and I used the excess liner to make the 30 foot stream. It took 5 tons of large rocks, 3 tons of 1" gravel and 2 tons of pea gravel to finish off the landscaping. I purchased many aquatic plants from several nurseries but I also found several native plants in our area and transplanted specimens into the pond. I am especially interested in hearing from anyone who has a pond in zone 4!!! 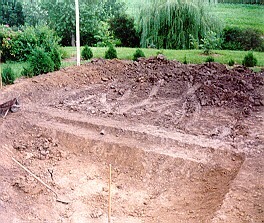 Here is the 1998 View of the pond. 1996-97 was my third winter for the pond. Each fall I bring in samples of all the Tropicals and have found out which plants survive indoors and which ones will survive outdoors. I discovered that some plants that shouldn't overwinter outside, do survive and at the same time don't survive indoors in the sheep tanks that I place them in. I have been tracking (unscientifically) the Pond Water Chemistry for 1995, 1996, 1997, 1998 and 1999. I use a Pool [Total Dissolved Solids (TDS) Meter and pH test kit] and an ammonia test kit to keep track of the water condition. It has been interesting tracking the changes in the chemistry of the water and how the water clarity changes along with it.